Have you ever tried chia pudding? If you haven’t, I’ve got a must-try recipe for you. Despite the numerous recipes floating around (you can find lots on my Breakfast pin board on Pinterest), I only made it for the first time not long ago…and I really like it! 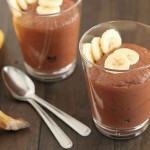 I found this recipe by nutritionist Joy McCarthy online, which is a little different than any of the other chia pudding recipes I’ve seen out there, and I changed her recipe slightly to come up with this Chocolate Banana Coconut Chia Pudding. With just a few simple and nutritious ingredients, you can whip it up and have it waiting in the fridge for when you need a snack or you can even have it for breakfast. Yes, chocolate for breakfast! If you’re unsure about having it for breakfast, know that it is not overly sweet, all the sweetness is provided by the bananas and the dates. So it’s naturally sweetened. The cocoa powder dulls out any chance of it being too sweet. You’ll have to try it to taste what I mean! 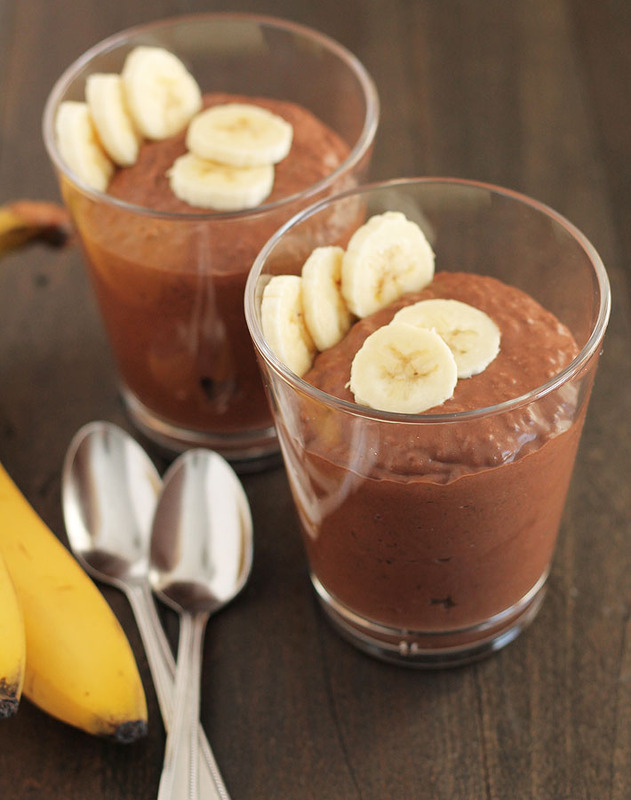 Chocolate Banana Coconut Chia Pudding is simple to put together but it takes a little time to set. I usually make it in the evening and refrigerate overnight so it’s ready for the next day. When you look at my pictures, the chia seeds in the pudding probably stand out. I know some people prefer to grind the chia seeds when making chia pudding so the end result is smooth (smooth like my chocolate mint avocado pudding! ), but I like to keep them as they are because they add a nice little texture. I have not tried grinding the chia seeds for this recipe but if you do try it, let me know how it turns out! And click these links for more breakfast and snack ideas! 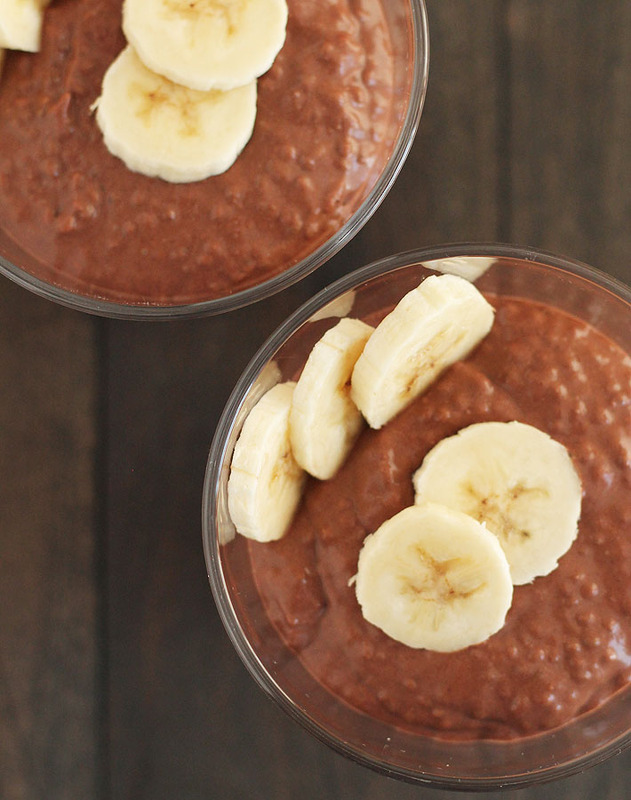 Whip up this delicious vegan & gluten free Chocolate Banana Coconut Chia Pudding in the evening and it will be ready for breakfast or snacks the next day. Soak dates in water for 30 minutes to soften them up. 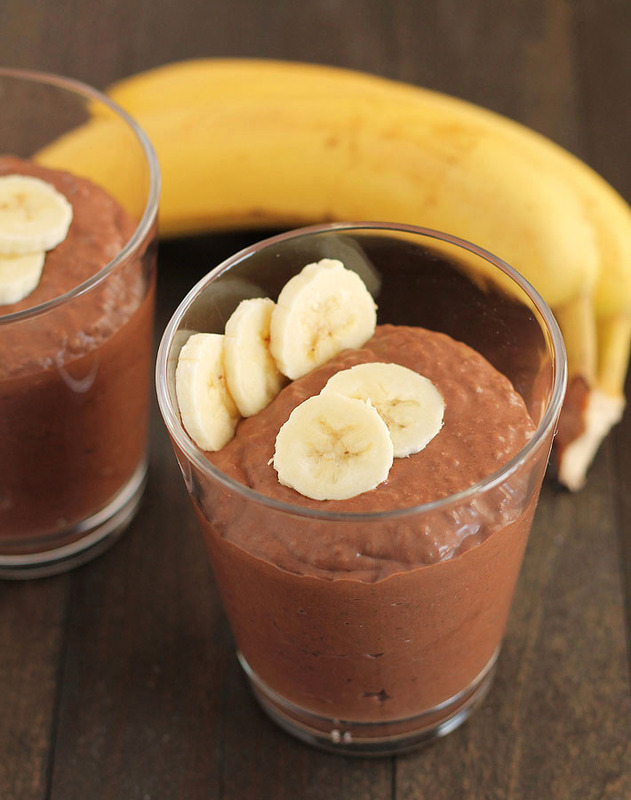 Add dates, bananas, cocoa powder, coconut milk, vanilla, and water to a blender. Pour mixture into a large bowl or container. Cover and refrigerate for a few hours or overnight so it can set. Garnish with the (optional) topping of your choice. 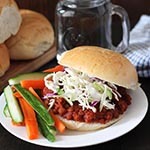 This recipe makes either 4 x 250ml or 2 x 500ml larger servings. Calorie count listed above is for a 250ml serving. Canned coconut milk must be used, not the coconut milk that comes in cartons. I use full fat coconut milk in this recipe, but light coconut milk can also be used. If using light coconut milk, cut back on the water being added to the recipe. Calorie count listed above is the recipe made with full fat coconut milk. Recipe adapted from Joy McCarthy's Banana Chia Pudding. Hi Hillary! I have never made the recipe without the dates, so I am unsure of a substitution. This article (https://food52.com/hotline/19004-good-substitutes-for-dates) suggests prunes or figs, but again, I have never tested with anything other than dates, so I can’t guarantee that the taste will be good. If you do try with something else, let me know how it goes! 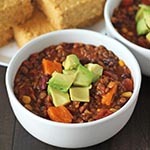 This recipe was truly delicious! My kids love it, we love it, and I’ve sent this link to so many friends and family members who also love it. We can’t wait to try more of your recipes! I’m so happy to hear you love it, Marie! And I’m also glad to hear your kids love it, that is always a nice bonus 🙂 Thanks so much for your note and for sharing the recipe with your friends and family, I really appreciate that! Just one word to describe this: EXCELLENT! This is definitely a keeper recipe. Thank you! What would be a good Alternative to Prune’s my German Hubby is intolerant to Prunes, dates and figs. Hi Steffanja! Prunes would have been my suggestion as a replacement for the dates but since your husband is allergic to those too, I am not sure. I have never used anything but dates in this recipe, so it’s hard to say with certainty what else would provide the same results. The dates are being used as a natural sweetener here and as a bit of a thickener too, so it would have to be something that could do those two things. Raisins *may* be fine, but I am not sure of the extent of your husband’s allergies or if they would do the same things as the dates. I hope this helps a little! Delicious! Thanks for the great recipe. Perfect and not too sweet! Thnaks for sharing, I will have it for breakfast tomorrow! This is some delicious masterpiece! 😀 Our first chia-pudding, and it was just perfect, better than store-bought and healthy as hell! Way to go! I’m so happy you like it! It’s a favourite over here as well! Thanks for circling back to let me know how things went, I appreciate it! How many ounces or mililiters is the can of coconut milk? They are available in different sizes here. 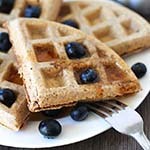 I made it with ground chia seeds and loved it! Am about to try something similar with pineapple and juice, coconut water or just filtered tap water rather than the coconut milk. Loving the healthy pudding options! Your instructions do not state when to add the cocoa powder. I presume in the blender? Correct 🙂 And thank you for pointing that out, Casey! I’ve updated the recipe. Looks delicious! I love chia pudding. I like the texture– kind of like tapioca or bubble tea, but smooth could be a fine change of pace, easily done in the blender. YUM! I love how healthy this is 😉 the chia seeds add so much nutrients to this pudding! and what a great flavor too! Thanks, Michele! I love adding chia seeds wherever I can to bump up the nutrition. Chia puddings are perfect for that 🙂 Thanks for stopping by!